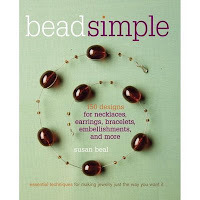 I've been reading all over about how fabulous Susan Beal's new Bead Simple book is. Ever since I saw a first glimpse of the cover on the web ages ago, I've been dying to get my hands on a copy. My wish finally came true, and folks ... this book does NOT disappoint. Everything I've read was right on. It's a big, thick, yummy, beautiful book. I've spent the last several nights dreamily perusing it before I drift off to sleep. It's no wonder I've had lots of dreams of jewelry this week! Bead Simple is gorgeous. It's styled in such a way that makes it a borderline coffee table book. Don't relinquish this book to the craft room bookshelf. It's one you'll want to keep out where you can look at it at any time, and share with friends. The projects are beautifully photographed, the illustrations are clean and simple and the typography pulls it all together in a way that's delicate without being too fru-fru. This book has got something for beading newbies and jewelry experts. The first part of the book has incredible resources and information about everything you need to get started making your own jewels. The descriptions of the supplies are simple and clear and the intro chapter makes for a great starting point and future reference. The project portion of the book is brilliantly organized. Each "chapter" has three variations on a particular theme. It's a great way to see how you can easily modify a certain technique or design to make loads of different, fun pieces. I love the chapter on vintage button necklaces. Remember how I haven't been a big button person in the past? Well, this chapter makes me want a button necklace for every day of the week. And it's not just baubles that you'll be making when you get this book. There are great projects for embellishing clothes, too! I love that! There are also some fun household projects - like the Name Dropper Wine Glass Charms. I've got dibs on Prince! And I haven't even gotten to the guest contributors. All your favorite crafty gurus are in here. My pal, Diane of Crafty Pod fame, has a beautiful Starburst Pendant design that involves wire twisting. I can't wait to give that one a spin. There's a fantastic project from Crafty Chica, Kathy Cano Murillo, that has a beautiful back story. I can almost hear Jennifer Perkins' Bric-a-Brac Charming Bracelet jingling off the page. 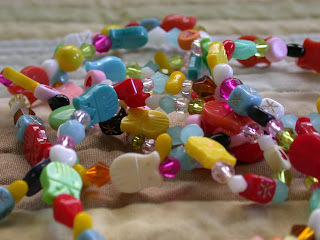 I have to say, I'm a sucker for simple, fun, colorful stuff, so Jenny Ryan's Candy Shoppe One Strand Bracelet is among my absolute favorites. I know it's all about the beads on that one, and I'm drooling over the tiny owl beads and little squares with atomic sunbursts on them. I NEED those! If I haven't convinced you of the luscious quality of Bead Simple, perhaps the price will do the trick. What can I say, I'm a practical, frugal gal at heart. So seeing this glossy, glorious, massive book filled with the designs of fabulous independent crafty folks priced at just under $20 ... that's a steal of a deal if you ask me. Treat yourself to Bead Simple. Like me, you won't be disappointed. Nice blog! Beading is something I've always wanted to do but never have. Thanks for the comment on my SewChic blog. The pattern weights do not shift because they are heavy. I rarely use pins anymore. Well you make it sounds so good! And those photos ARE lovely and candylicious! I'm not really a jewellery making girl, but I'm tempted to have a peep at this now! Aw, thanks for the shout-out! E-mail me your address and I'll send you some of the starburst beads!! I can drool over the pretty beads, though. Hey lady thanks for the shout out about my bracelet! Don't you just love that book? It's gonna keep me busy for quite some time. Come silk screen with me!